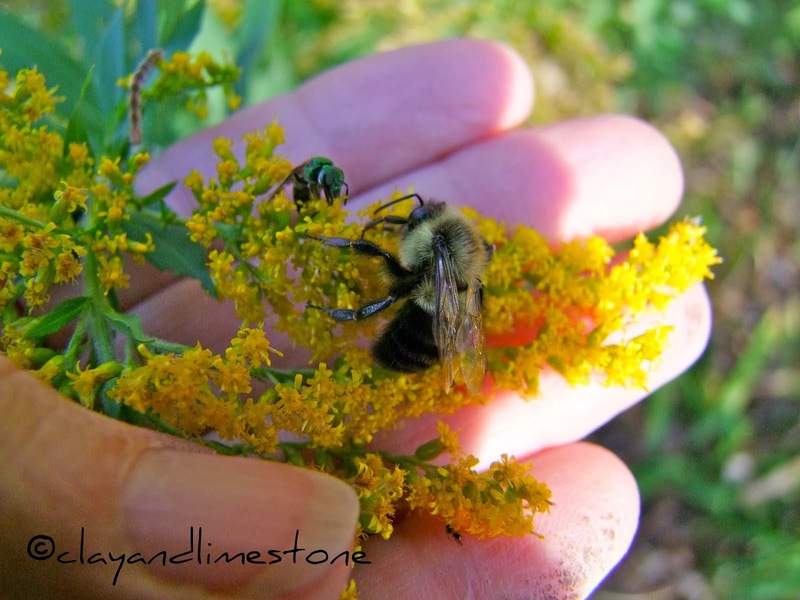 clay and limestone: Wildflower Wednesday: Embrace imperfection in your garden! Wildflower Wednesday: Embrace imperfection in your garden! When you commit to a pesticide free garden you have to be prepared for chewed on petals and foliage. Are you ready to embrace imperfection? You won't be sorry when you do. Bees, butterflies, skippers, beetles and hoverflies will move into your garden. It will be alive with critters. Your garden will not be magazine perfect, but, pollinators don't care if your flower petals are chewed on. They need flowers bursting with pollen and nectar. Your garden will be teeming with life. Spiders will build webs; the beneficial insects will keep aphids in check; pollinators will pollinate; and, birds will hunt the insects. It will be a beautiful imperfect garden, just as it's supposed to be. When you let go of pesticides and embrace imperfection you become the change our world needs. You can help create a paradigm shift that redefines garden beauty to include imperfection. You can refuse to be shamed or swayed by the judgement of perfection worshipers. 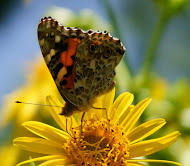 You can say no to pesticides that poison flowers and kill our important garden visitors. You can let nursery managers know that you don't need or expect them to offer "perfect plants" that have pretreated with insecticides. If we all work together, we can become the change our world needs. Welcome to Wildflower Wednesday. It's the fourth Wednesday of each month and time to celebrate wildflowers from all over this great big, beautiful world. When I walked around the garden planning for WW, I noticed that several coneflowers had been chewed on by insects. It seemed an opportune time to encourage my fellow wildflower enthusiasts to embrace the beauty of a pesticide free garden's imperfection. All the coneflowers shown (Echinacea tennesseensis, E purpurea and Echinacea cultivars including 'Ruby Star', 'Magnus', and 'Prairie Splendor') are imperfect beauties. Not only have they been chewed on by critters, their offspring are different looking with their petals poking every which way. It happens~plants get chewed on and offspring are not true! Happy Wildflower Wednesday! Please add your url to Mr Linky and leave a comment. As we get another slice of garden ready, paving stones laid to define the planting beds, I delight in a future visit to a local nursery which shares our biodiversity and indigenous choices. I loves me some bees and bumbles. No pesticides here. Lots of chaos. Thanks for the beautiful reminder...I think these pictures show more beauty than any magazine Gail. I joined in with my post from a couple of weeks ago that I had to post early. Good message, Gail. I am not one to use pesticides either, I love the insects that visit. I also don't usually join memes but I too write on this subject quite a bit and made an observation on pesticide use recently. Awesome post, Gail! I am getting ready to have a garage sale Saturday with lots of baby items, and forgot today was WW. I'll have to take a break and do a quick post. I have been taking photos of critters on the blooms off and on still. Wonderful post! I think more people are becoming aware of the beauties of imperfection and the importance of pesticide-free gardens. It is one of the most hopeful signs for our future. Casa, some years, mine get those, too, but this year seems to be the best they've ever looked. Hopefully, yours will do better next year. Your echinacea and butterflies look so pretty, I can't wait to see my echinacea this year, hopefully some I grew from seed last year will bloom. I've never used pesticides, actually bugs are not my problem as much as weeds and mammal pests. I suppose I live in an unusual area. My gardening emphasis is on providing as many kinds of flowers as I can for pollinators, so allowing the wild plants to grow and bloom helps a lot with that. Your garden looks perfect to me--full of life of all types and varieties! Thanks for hosting this--one of my very favorite memes! I too have never like a clean looking garden.I have started putting in more natives to my Northen,Ca garden.magic is happining. I am embracing imperfection in more ways than one this year, including weeds:) But definitely no pesticides--all pollinators are welcome in my garden, just not the bunnies! Always enjoy seeing the photos of the bumbles in your garden. A very important point that should be accepted by all gardeners! Your photos are gorgeous, and it's not just the flowers, which ARE very pretty. What camera do you use? I would love to take photos like that. Expecting perfection only leads to disappointment. Well, maybe instead of embrace, can I tolerate? I often wonder about those closeup photos of perfect blooms, because they sure don't exist in my yard! Right there with you, Gail. I've got some coneflowers that look about the same. That's funny, I thought I had left a comment but I guess I didn't hit the right button, lol. Gail, this is such a great sentiment, and one that should be encouraged...says the woman with the holey hosta's and chewed golden hops that resemble lace. This is indeed the worst/best year for bugs around here, the petals are torn, demolished, eaten, and bruised, but the pollinators are bounding, and happy. When I get discouraged about the devastation, ahem, feeding zones...lol, see I'm trying to put a happy spin on it, I just step back a few feet and the holes and torn leaves disappear. No it's not quite that bad, the early part of the season was a chomping fest, but since the heat has taken over so intensely things just grew beyond the holes, so it's not that obvious. It's all part of gardening, and the joy I get when I see a butterfly, or hummingbird land on those Bee Balm means it's so worth every hole in a leaf. I am constantly encouraging my neighbors to think of the birds, and nature, quail...four new babies this morning wandering across our lawn. No pheasants lately...and the sprays they use on their lawns make me worry about the birds, and the safety of the deer, and these peoples pets. It's a education that comes slowly to those who use pesticides, but one by one, hopefully they will learn to embrace imperfection. Enjoy cone flowers as the deer mostly leave them alone and the goldfinches love them. Gail, do you ever do training in for parents in schools settings? Please let me know, I have parents and neighbors of my school who would love to learn more... you can contact me on the school website.